Give Dad his Dream Weekend with a special gift from The California Wine Club! It's June, the summer solstice in the Northern Hemisphere is only three weeks away, and a lot of wine lovers who usually prefer hearty, more robust red wines are turning to something more, well, refreshing. Chill a white, chill a pink wine, that much is easy. But how about a summer wine for red-wine lovers? This is our quest for June in Wine Focus in our WineLovers Discussion Groups. The Gamay grape of Beaujolais is an obvious choice, but we're sure you'll find plenty more "cool" reds particularly well suited for cooling enjoyment when it's too darn hot. Bonarda from Argentina, lighter-styled Dolcetto and Barbera from Northwestern Italy, and even Pinot Noir will often serve this purpose well, although I wouldn't try to tame a big-boy California Pinot for this purpose, nor take a Burgundy of any quality much below a just-cool "cellar temperature." 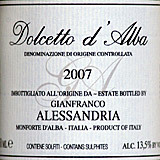 We tried an Italian red, Gianfranco Alessandria 2007 Dolcetto d'Alba, over two nights recently, serving it the first night at room temperature and the second after about 45 minutes in the refrigerator, just until the bottle felt cool to the touch. The warm glass was certainly more typical of Dolcetto, earthy and more tannic than tart. Chilled, it seemed distinctly lighter and more refreshing, although the combination of chilling and, perhaps, a day in an opened bottled slightly heightened a noticeable but acceptable whiff of red-wine vinaigrette. See my tasting notes below. READERS NOTE The 30 Second Wine Advisor is published once per week for now, usually mailing on Monday, Tuesday or Wednesday. We're using new Emailing software that should be much more efficient in the long run, but if you discover formatting problems or find the Wine Advisor trapped by an overly aggressive "spam" filter, please drop me a note at wine@wineloverspage.com to let me know. * Side Job Cellars 2005 C-5 Dry Creek Zinfandel - This 90 pts Zin is a perfect match for Pepperoni Pizza. * Red Car Wine Company 2006 "Speakeasy" Syrah – This 93 pt Syrah is big, bold and Barbecue friendly. * Courtney Benham 2006 Paso Robles Lucca Cabernet Blend – An easy-going blend to pair with Sunday's game. Save $25 on Dad's Dream Weekend Gift Set. This three bottle gift is just $88 plus shipping and handling. Visit Dad's Dream Weekend Wine Gift Set to learn more or call 1-800-777-4443. Quantities are extremely limited, please reserve your gift now. Since 1990 The California Wine Club has introduced wine enthusiasts to the best of California's small, "mom & pop" wineries. It's a true California wine adventure! There are no membership fees, you may cancel anytime and every wine is 100 percent guaranteed. To learn more or try the club for yourself, visit www.cawineclub.com or call 1-800-777-4443.